The detailed algorithms in BassBox Lite provide a more complete model of a driver in a closed box than many other box design programs or the look-up tables in many box design books. The advantage of BassBox Lite is that it provides a more accurate picture of the "real" world as long as accurate information is entered. BassBox Lite also includes an option to dumb-down its model so it operates more like the simplified "classic" equations. This is accomplished partly with the "Use Classical box calculations" setting on the "Damp" tab of the "Design Properties" window of the program. This can also be made the default setting using the "Box" tab of the "Preferences" window. To understand the difference between the BassBox Lite and "classical" box models, let's see what it takes to make BassBox Lite produce similar results as other programs. This is possible because BassBox Lite allows you to control many of its internal parameters. Three of these parameters are the Q of the box leakage losses (QL), the Q of the box absorption losses (Qa) and the ratio of heat at constant pressure to that at constant temperature for the air inside the box (gamma). These parameters are often ignored by more simplified closed box models. Normally, QL is controlled on the "Box" tab of the "Design Properties" window. But the default value of QL and the value used for an "optimum" closed box (or vented or bandpass box) is controlled with the default QL settings of the "Box" tab of the "Preferences" window. Normally, Qa and gamma are set whenever you select the box damping ("fill") setting with the "Damp" tab of the "Design Properties" window. However, the default values for each "fill" setting are controlled on the "Box" tab of the "Preferences" window. Begin by selecting the "Preferences" command in the "Edit" menu to open the "Preferences" window. Next, select the "Box" tab. The QL settings in the lower left corner of the "Box" tab set the maximum and minimum values for QL depending on the box volume. BassBox Lite will interpolate between these maximum and minimum values as necessary. Note: QL gets smaller as the box size gets larger. Enter a very large value for both QL settings such as: 1000000. Making QL very large makes it appear as if there are no box leakage losses. (QL increases as the box leakage losses decrease.) Giving both default QL settings the same value forces the program to always use that value when calculating an "optimum" box. Next, set the default Damping (Fill) Setting for Closed Boxes to "None". Change the value of Qa for a box with "No Fill" to a large value such as 1000000. This makes it appear as if there are no box absorption losses when "No Fill" is selected. Only the "No Fill" setting for Qa needs to be changed. The settings for "Minimal", "Normal" and "Heavy" amounts of fill do not need to be changed because we won't use these settings. Confirm that the default value of gamma (the Greek symbol below the Qa setting that looks kind of like a "y") is set to 1 (one) for the "No Fill" setting. Close the "Preferences" window with the "Accept" button. Begin a new design (Ctrl+N) and enter a driver (Ctrl+D) or open a previous design which contains driver information. Open the "Design Properties" window (Ctrl+B) and design a closed box. 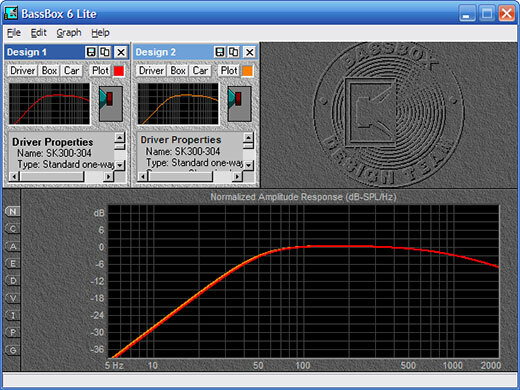 As long as the damping setting on the "Damp" tab is set to "None" and QL on the "Box" tab is left blank (or manually set to 1000000) the results produced by BassBox Lite should be similar to other programs which use a more simplified model. Both the red and orange plot lines in the above example represent an "optimum" closed box. The red plot line shows an "optimum" closed box using the preferred BassBox Lite model. The orange plot line represents the same "optimum" closed box with a simplified closed box model that ignores QL, Qa and gamma. Notice that there is very little difference between the response of both boxes and yet BassBox Lite used a box that is more than 10% smaller than the simplified model. The box could be even smaller if a "Heavy" fill setting were selected. The advantages of a more detailed model are obvious—unnecessary box size can be avoided. Vb = 56.7 liters, Qtc = 0.707, QL = 18.5, F3 = 52.1 Hz, Fill = none. Vb = 63.1 liters, Qtc = 0.707, QL = 1000000, F3 = 49.7 Hz, Fill = none. For the red plot line, the standard default values for QL, Qa and gamma were used for the "Preferences" window (see the BassBox Lite on-screen user manual). Finally, please note that the QL, Qa and gamma settings do not affect the BassBox Lite algorithms that generate the graphs. The performance graphs will accurately display whatever parameter settings you use. When you are not sure which approach to use, we suggest that you base your decision on the performance you observe in the graphs.